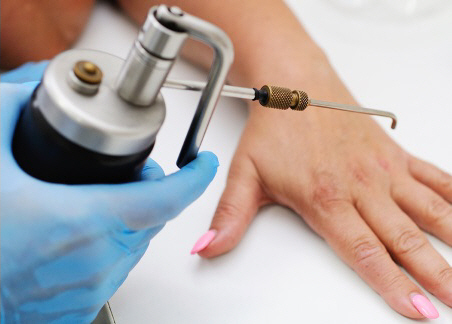 Cryotherapy means treating skin lesions (such as warts) by freezing them. Liquid nitrogen spray is usually used for this. Liquid nitrogen is nitrogen that's been changed from a gas into a liquid by making it very cold. Many surface skin lesions can be treated with cryotherapy. Bowen's disease (an easily curable early form of skin cancer). Occasionally, your doctor or dermatologist may suggest using cryotherapy to treat a small skin cancer called basal cell carcinoma. Cryotherapy is a routine procedure that your doctor or practice nurse can perform without any special preparation. Your doctor or nurse will apply liquid nitrogen to your skin. You will feel some minor, local pain. This is very individual and depends on where the lesion is treated. A local anaesthetic is rarely required. It takes just a few seconds, depending on how big and thick the lesion is. The frozen skin becomes white and takes around 20 seconds to two minutes to thaw to normal skin temperature. Your doctor or nurse may suggest doing it again once your skin has thawed. A scab may form over the next few days. It will take one to two weeks (and sometimes a little longer, especially on the legs) to heal and then peel off. Sometimes you need several treatments. How do I treat the area after the procedure? Your doctor or practice nurse will explain how they would like you to care for the treated areas. For example, they may suggest applying Vaseline. If the scab gets wet, pat it dry with a soft towel or tissue. Do not to pick at the scab as this will encourage scarring. If the treated area is likely to be knocked or rubbed by clothing, consider applying a dressing or plaster. However, this is not usually necessary. You may experience some minor pain, especially if you have a deep freeze to treat a basal cell carcinoma. But if you experience discomfort during or after the treatment, you can help this by taking pain relief (such as paracetamol) in the first 24 hours. If you're concerned about discomfort, take pain relief an hour or so before the procedure. Swelling and redness is normal and usually settles after two to three days. For a few days the treated area may ooze a little watery fluid or form a blister. If you have cryotherapy close to the eyes, you may experience prominent puffiness of the lower eyelids, but this will settle within days. Once it heals, the treated area will probably look normal, although you may have some scarring and discolouration (especially on your legs). Infection in the treated area is possible. If you're concerned about infection or anything else after the procedure ask your doctor or practice nurse to check the treated area. Written by HealthInfo clinical advisers. Last reviewed January 2017.